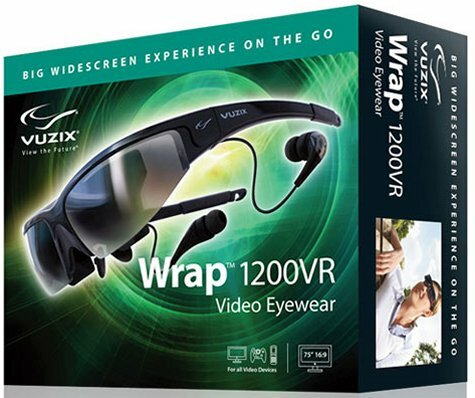 Vuzix presents the Wrap 1200VR, a new video eyewear kit that promises to deliver the same experience as watching 3D content on a 75" display from 10 feet away. The device is sold on the company's site for $599.99. Vuzix Corporation (TSX-V: VZX, OTC:BB: VUZI, FMB: V7X), award-winning manufacturer of video eyewear, is excited to announce the availability of the Wrap 1200VR. The sunglass-style Wrap 1200VR brings virtual worlds to life with a 16:9 widescreen, virtual display and superior head tracking for step-inside gaming. The supersized display with a 35 degree field of view is the equivalent to watching 3D content on a 75 inch display from 10 feet away. The Wrap 1200VR’s new head tracking technology, Wrap Tracker 6TC with compass, has 9 sensors that work together to create a 3 degree of freedom solution with automatic drift compensation for smooth, realistic motion tracking. The Wrap 1200VR supports the latest side-by-side 3D video format, with support from more than 100 titles for 3D video and/or head tracking. This includes popular game titles like Call of Duty: Modern Warfare, Fallout 3, F.E.A.R and many more. The Wrap 1200VR connects to virtually any Windows graphic card desktop or laptop computer, regardless of make or model. Windows 7, Vista and XP (32 and 64-bit versions) are all supported which makes the Wrap 1200VR a perfect big screen interactive gaming monitor. Optional interfaces enable the Wrap 1200VR to connect to component video devices like the Xbox 360 and PlayStation 3 consoles. The Wrap 1200VR is the only consumer virtual reality system featuring individual focus for each eye and has optics that allow the user to position the displays to match the user’s IPD (Interpupillary Distance or eye separation). This enables optimum display positioning in front of each eye (much like binoculars) to ensure the best user viewing experience possible. Like other Wrap models, the 1200VR fits comfortably over most prescription eyeglasses.